If quinoa has not been pre-rinsed prior to packaging, then soak grains in water for a few hours; changing water a few times. Prepare quinoa: bring vegetable broth, reserved oil from the sun-dried tomatoes jar and salt to a boil. 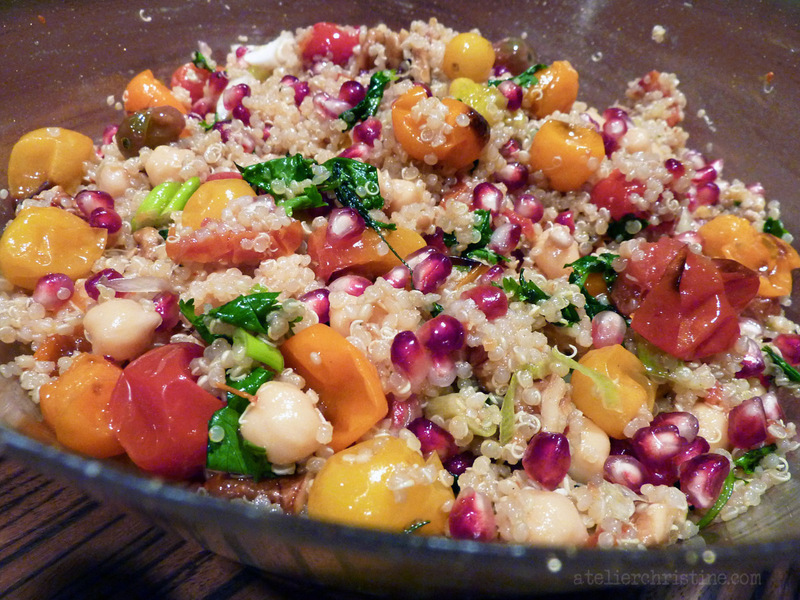 Add quinoa or bulgur; stir to coat. Bring to a boil again, reduce to simmer, cover, and cook 15-20 minutes (20-30 min for bulgur) until all water is absorbed. 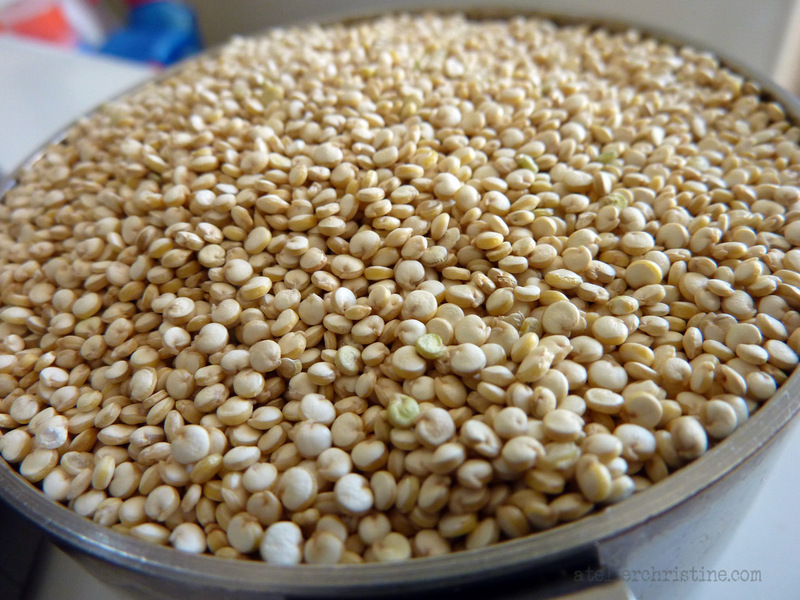 Cooked quinoa germs will look like tiny curls. Turn off heat, cover with a towel and let stand 10 minutes. Gently fluff with fork and set aside to cool. 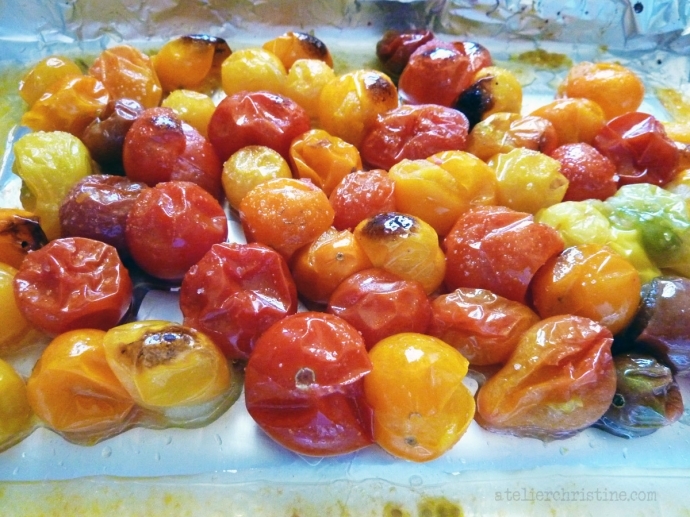 Meanwhile, broil tomatoes in the oven with some olive oil and sea salt until they just start to pop and are slightly charred. Transfer to a bowl, reserving all the juices. Prepare dressing by whisking all ingredients together. Assemble salad: combine cooked quinoa/bulgur, sun-dried tomatoes, roasted tomatoes, walnuts, almonds, pomegranate arils, chickpeas, green onion, cilantro and mint. Toss in dressing or pass alongside salad. Serve warm, at room temperature or cold. * Make sure selected pomegranate is plump, heavy and deep golden red in color. Arils should be firm, reddish in color, sweet yet sour. To separate arils from the white pith you will need to work “underwater” in a bowl of water. Cut the skin in a couple places and break-up the pomegranate with your hands into sections (water prevents juices from splashing all over the place and discoloring your fingers, and helps in separating the arils). Keep working underwater while you pull apart the kernels; discard the chunky skin pieces as you do so. Stir the water vigorously a few times then set aside for a while. Remove white pith pieces that float on top. Stir once more and repeat until no more skin and pith are left. The arils will sink to the bottom of the bowl. Drain water and pat-dry on paper towels.